The covered stand is being addressed as a priority by HPCFA, the options are to strip back and repair with a slightly different shape or remove and replace altogether. Just a reminder that tomorrow's home match against Port Glasgow Juniors will be played at New Tinto Park, kick-off 2pm Our remaining home fixtures will be played at McKenna Park home of St Anthony's. A big thank you to Felix and the guys at the Ants for accommodating us during our homeless period. Yoker's next HOME match will be played at new Tinto Park against Port Glasgow Juniors, on the 2nd February 2019, kick-off 2pm. Many thanks to Benburb FC for accommodating the fixture. The pitch was soft but perfectly playable in my opinion, there was no surface water and only light rain forecast during the day. The referee arrived 45mins before kick-off and proceeded to bounce the ball all over the park for 15 minutes before calling the game off. The unfortunate side effect is that this was very costly and time consuming for both teams who have it all to do again in March. As a side note I would like to thank Lugar for their excellent hospitality which they hastily rearranged before we made our trip back to Yoker. Yoker Athletic v Royal Albert, match postponed due to a waterlogged pitch. Stevie Frew retired from the club at the end of last season but still continues to sponsor indeed providing a set of new strips that you saw yesterday. In terms of the committee perhaps, it's time they stepped aside and let someone else take the club forward. Unfortunately, I doubt there will be a queue of applicants for those particular posts. To clarify, Holm Park is the ground that Clydebank used to share with Yoker. 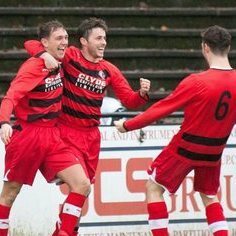 Clydebank now share with Maryhill so that is now their home ground at the present time. The new management team inherited a team that lost several players from last season but have done well to bring in new faces. The issue on Saturday was Yoker had 10 players missing from the squad due to injuries and holidays, not an excuse just a fact.